Conkle's Hollow is named after W.J. Conkle, an early visitor to the ravine. In 1797, Conkle carved his name into the west side of the cliff. According to legend, local American Indians (most likely, the Shawnee) once hid some money in a small opening on the gorge's west wall. As the legend ran, they had stolen the money from white settlers rafting down the Ohio River. The opening was located high up on the cliff wall. To reach it, the Shawnee had chopped down a tall hemlock tree and then climbed up it, using it as a ladder, to hide the money. They then pushed the tree to the ground, so it could not be used again. They chiseled an arrow, which pointed to the money, on the gorge's eastern wall. The Shawnee intended to use a second tree to reclaim the money, but a storm knocked the tree down before the natives could return for the money. The money, purportedly, has never been found. 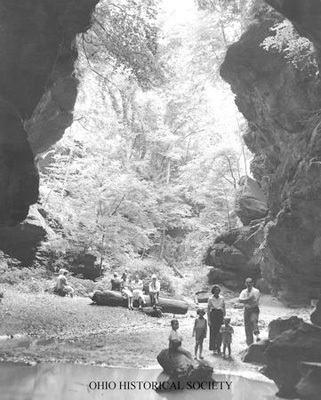 Many early settlers claimed to have seen the arrow carving on the gorge's eastern wall, but it no longer remains visible.